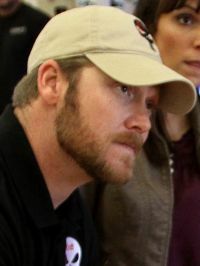 The American Sniper Chris Kyle murder trial has received a great deal of attention, and the individual at the heart of the controversy, Eddie Ray Routh, is being debated as another dubious psychosis defense. While the prosecution admits that Chris Kyle was aware his murderer was “straight up nuts” in a text to his friend, he still took Routh to a shooting range. As tragic and horrible as this is, it does not help the image of veterans suffering from PTSD. Like it or not, the defense may do more harm to vets struggling with PTSD than it helps. An opinion piece in The New York Times further explores the topic that our attitude is at the heart of the problem with psychosis treatment. Luhrmann cites evidence from the British Psychological Society who now suggest that the biomedical model of psychosis is not the only way to understand the disorder. She suggests the pendulum has begun to swing back generally toward talk therapy, as researchers find progressively more problems with the biomedical medical model for diagnosis when it comes to psychological issues—especially the lack of usefulness in diagnostic labelling and the great value already demonstrated by talk therapy. It’s about time. Lloyd Sederer, a physician, challenges his readers in the Huffington Post to rethink what they believe about PTSD and trauma. He recounts the story of treating a Vietnam vet with PTSD that occurred in childhood, and posits the notion that psychosis and substance abuse may simply be an individual’s way of coping with the trauma of childhood. He argues that treatment that aims at healing the psychic trauma, rather than imposing prison sentences, is the better solution for PTSD. Scientific American’s article examining the epigenetic effects of PTSD and trauma experience by Holocaust survivors on the offstprings of those who endured starvation could also be entitled, “Hitler’s Final Solution Proves Eugenics is a Pipedream.” If the basis of eugenics is that there is one perfect race, they won’t stay perfect for very long in this world! Not only did the parent’s body chemistry change to tolerate greater amounts of cortisol in order to help the liver and other vital organs survive starvation, but also the children of the survivors demonstrated a propensity for PTSD and anxiety as their own bodies altered to increase production of cortisol and the enzyme that breaks it down, making the children better able to endure type 2 diabetes as well. One could argue Hitler just disproved his own hypothesis. An article in The Atlantic examines how our attitude towards auditory hallucinations and psychosis, commonly found alongside PTSD, may impede our ability as clinicians to help clients integrate their auditory multiplicity. Morin travelled to the Netherlands to interview Dirk Corstens, a student of Romme, and the clients he serves. Their experiences and perceptions of their psychosis are both insightful and telling of the complexity of psychosis. It also explains how Corstens effectively uses relationship therapy to work with his clients to process the voices they hear. Corstens engages the clients in discussions to understand their experiences of the voices and to get to the voices themselves—who they are and what they want. This experiential processing allows the clients to gain more acceptance of themselves and their situations, making their lives easier to manage. In Mad in America, Will Hall suggests the attitude of a clinical label such as schizophrenia impedes the ability to see a person as a whole. He describes a man with schizophrenia as brilliant, spiritual, intuitive, and artistic rather than as a stereotypical patient with symptoms. He proposes a new perspective on the idea of forced treatment, one which usually translates into antipsychotics, and instead presents a holistic view for working with the whole person, not just the symptoms of schizophrenia. Elderly patients are often diagnosed as depressed when they may just be lonely and in need of human companionship after losing a spouse. In this Daily Mail article, the author suggests that doctors should not be so quick to dispense antidepressant drugs that can be detrimental to the health of the elderly. Instead, the article offers simple yet effective strategies for resolving the loneliness that can be more hazardous to the health of people over the age of 75 than obesity or smoking. Spending more time with an older relative or even just paying a visit to check in on elderly neighbors can have a huge impact, according to the article. Atypical antipsychotics have been found to be overprescribed, especially in the elderly, and overrated as the effectiveness of the drugs have been found to be much less than once believed. Yet, clinicians and doctors still cling to the false hope that popping a pill will fix a lifetime of sorrows and trauma. In his article in The Pharmaceutical Journal, Glen I. Spielmans gives ample evidence that the market for antidepressants and antipsychotics may be of greater benefit to pharmaceutical companies and understaffed nursing homes than the patients they serve. Rethinking the whole concept of mental illness and the role of psychosis is desperately needed, he argues. Finally, in Mad in America, Philip Hickey examines the story around a quietly retracted Stockholm study that claimed to show that antidepressants prevented suicide. An examination of the actual data (which required a court order to actually release it) found a “massaging” of the statistics occurred to enable the researchers to come to their convenient conclusions. In actuality, the study demonstrated that more than 56 percent of the suicides evaluated where the individual had been in psychiatric treatment the previous five years showed the deceased had anti-depressant drugs in their blood at the time of their suicide. Hickey chastises the research community for quietly brushing this flawed report under the rug and allowing an erroneous retraction statement to stand unquestioned.